The QAC1250 generators feature a new cooling concept that uses an electric fan controlled by a variable speed drive. The isolated Peruvian city of Iquitos is now enjoying a reliable 24-hour supply of energy thanks to a modular power plant supplied by Atlas Copco. Iquitos City, the largest metropolis in the Peruvian Amazon, is considered as an island in the Amazon rainforest and not connected to the Peruvian national grid. The city needed its own power grid. One company supplied a modular power plant. The modular power plant, comprised of four QAC1250 generators from Atlas Copco, has been integrated with the city’s current energy system. It plays a crucial role in providing the 15 MW of power that Atlas Copco’s customer, Power Solutions, must produce according to its contract with Electro Oriente. Modular power plants, which are also known as mobile IPPs (independent power plants), are usually comprised of groups of small generators that are programmed to work in parallel with each other. Coordinated by a network of controllers, these plug-and-play generators can power up and down according to the on-site power requirements at a given time. Modular power plants are being increasingly used: because reliability is enhanced when the failure of a single unit is mitigated by other units increasing their output to maintain the same power. By contrast, the failure of a large single generator could cause critical downtime. The QAC1250 generators feature an electric fan, controlled by a variable speed drive, to create precisely as much cooling as is necessary, without wasting a single watt on over-cooling. Ventilation is achieved using a system of radiators and ventilators housed in a special compartment designed by the company. This not only means the QAC1250 is a technologically advanced generator, but also means it could be the most efficient generator on the market in this power range, with reduced fuel consumption and noise levels. The generator produces a low level of emissions. The QAC1250 saves approximately 3% fuel compared to its direct competitors, which is approximately 15 litres less fuel per operating hour, 360 litres less per day and 1 kg less CO2 emitted into the atmosphere. The four generators installed in Iquitos will emit 1.5 tonnes less CO2 per year than the other generators installed at the thermal power plant. In addition, the cooling system of the QAC1250 adapts to the needs of each region, which makes it a good solution for the hot and humid environment of the Amazonian rainforest. The generator used in Iquitos’ modular power plant features the Cummins motor and Leroy Somer alternator, and the Atlas Copco Qc4003 controller. This controller can synchronise up to 32 generators in parallel. 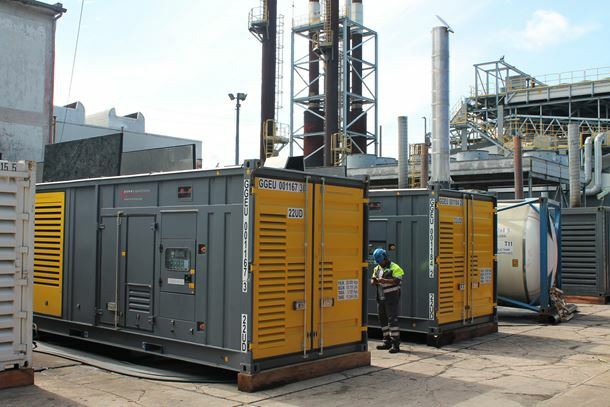 The Atlas Copco’s Modular Power Plant with four QAC1250 was installed in less than two days. The integration required the installation of two portable transformers to raise the QAC1250 output voltage from 400V to the distribution voltage at the thermal power plant of 10.5kV. At Iquitos’ thermal power plant, Electro Oriente has an installed capacity of approximately 50MW, with 15MW of power leased to its customer Power Solutions, of which 4MW is produced by Atlas Copco generators. This leased power is due to an increase in electricity demand in the capital Iquitos over recent years.